MSRP (Manufacturer's Suggested Retail Price) is the list price of a product, or the price at which the manufacturer recommends that retailers sell the product. Some stores choose to sell products at or above the MSRP, only reducing the price below the MSRP when products are on sale. Other stores routinely sell products below the MSRP. The Product Editor contains options to allow store admins to specify each product's MSRP. The MSRP setting is optional, and may be left blank. If an MSRP value has been specified for a product, and the MSRP value is greater than the product's actual price, then stock template packages will display the product's MSRP and MSRP savings on the product detail page. The MSRP savings is the difference between the product's MSRP and the product's actual price. 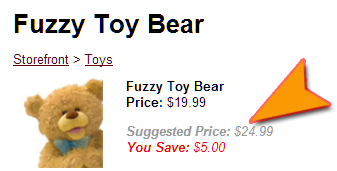 Product SID 142 (Fuzzy Toy Bear) has a price of $19.99 and an MSRP of $24.99. Since the product has an MSRP value, and the MSRP value is greater than the product's default price, the product detail page will display the MSRP and MSRP savings. If an event or product Sale Price is added that reduces the product's current price to $14.99, the additional savings will be included in the MSRP savings displayed on the product detail page.